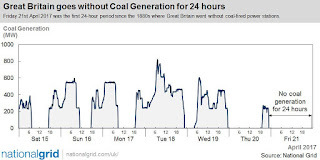 Statistics from the National Grid show that last week was officially the UK's first ever working day without relying on power from coal since the industrial revolution. The UK has relied on coal for power since it began using the fossil fuel and the only remaining plant (West Burton 1) went offline on Thursday 21 April 2017. Nation Grid tweeted the above graphic, highlighting the first period of coal free power since 1880. 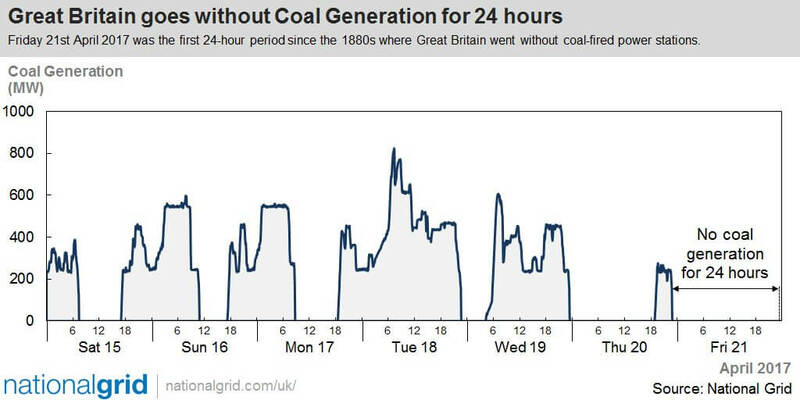 This isn't the first time England has been powered coal-free, as during 2016 shorter periods were also successful - the largest of note being 19 hours. Coal's share of the market also dropped to 9%, down from 23% in 2015. The government and energy industry have been working on making the country coal free as alternative methods of production develop - coal-free days will become more common as these options become more and more viable. Coal was the main method of powering the UK until the early 1990s, and 2025 will see the forced closure of the last coal power station, as per existing government plans to move away from being reliant on fossil fuels and meet the UK's commitment to renewable energy. Mainland Europe still hold the best record for using renewable power alone, last May Germany and Portugal had fossil fuel free periods. Image courtesy of National Grid Twitter. 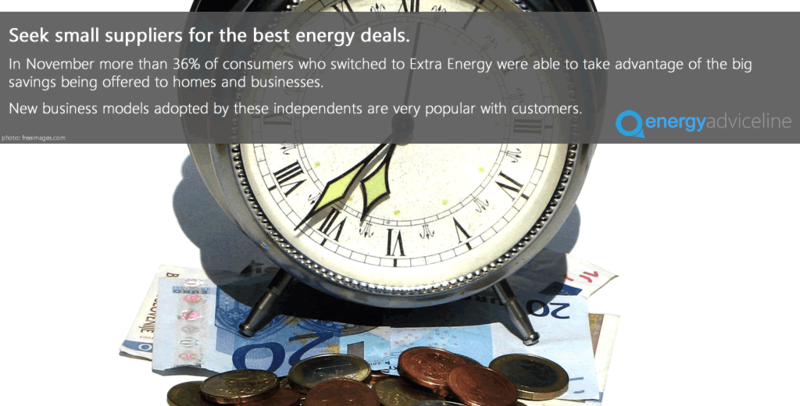 The Energy Advice Line has joined calls for small businesses to be given the same consumer protections as domestic energy users. The call comes as it emerged that business energy users would not receive the much-trumpeted announcement of a self-imposed price freeze by Big Six supplier SSE. 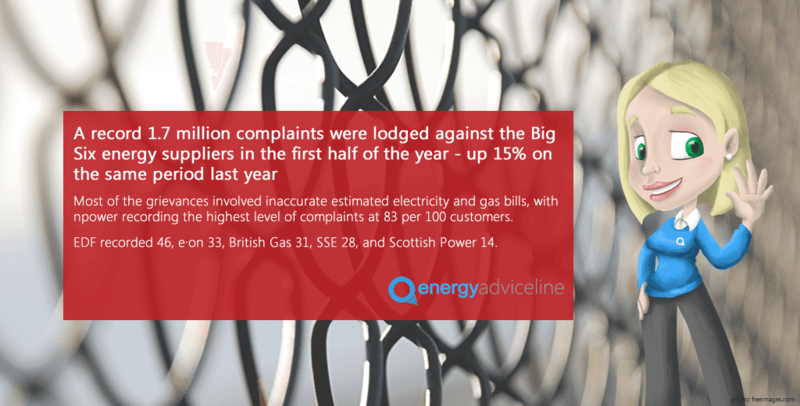 Julian Morgan, managing director of the price comparison, switching and advice service for domestic and business energy customers, said the plight of business energy users had been ignored for too long. He backed calls by the Federation for Small Businesses (FSB) for a better deal for small and micro businesses. The FSB said they were disadvantaged compared to domestic energy users and large companies when taking out energy contracts. "We support calls by the FSB for micro businesses to be given the same consumer rights as domestic consumers when it comes to energy," Mr Morgan said. “The clear message for consumers is that there are highly competitive alternatives to the major players now and it makes sound financial sense to take a look at what the independents are offering,” Mr Morgan said. 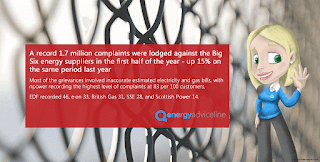 The Energy Advice Line has welcomed a government initiative to protect failing but viable small and medium-sized firms from having their energy supplies disconnected. Under the plans, struggling SMEs will have their gas, electricity, water and essential IT services safeguarded while administrators put together a financial rescue package. Suppliers will have their payments guaranteed before other creditors so that they can be certain their bills will be prioritized. Only if bills remain unpaid 28 days after the rescue package has been implemented will they be allowed to disconnect services.